NEW for June 2007 - Reflex Nexgen has been re-formulated to "Nexgen EVO" Previously our best selling multi-vitamin for retail and trade customers alike, the latest incarnation of Reflex Nexgen looks to be another surefire winner. 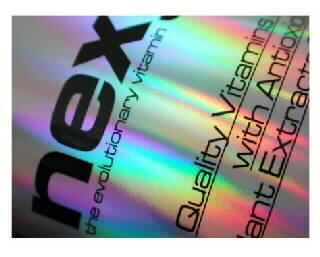 In over 10 years Nexgen� is the finest vitamin product we've ever made.. If you have not used Nexgen� before, the basic principle behind this reformulated product is to produce a multi vitamin supplement incorporating the most advanced, natural and universally acclaimed ingredients. Vitamin K2 is the most biologically active form of vitamin K. It is studied for its role in bone health and cardiac function. Found in the Japanese fermented soy food called Natto, it's the focus of great scientific interest. It contains superior Vitamin B12 as Methylcobalamin. It contains Selenium SeLECT� instead of ordinary sodium selenate. Selenium SeLECT is Sabinsa Corporation's branded L-(+)- Selenomethionine compound. The most bioavailable and pure form of selenium. Lutein is a yellow carotenoid found in many plants and animal tissues. It is the primary carotenoid in the macula (the central area of the eye's retina). Clinical studies have shown that Lutein may protect the macula from potentially damaging forms of light and thus may slow or stop the progress of Age-Related Macular Degeneration (AMD). Scientific research has established that carotenoids like beta-carotene, phytoene, phytofluene and other tomato phytonutrients found in Lyc-O-Mato are synergistic and play a vital role in helping to maintain good health. Derived from Chinese green tea leaf, this special extract contains 95% polyphenols of which 70% are catechins and 30% epigallocatechin (egcg). The antioxidant strength of green tea is continually the focus of intense scientific research. Proanthocyanidins' antioxidant capabilities are 20 times more powerful than vitamin C and 50 times more potent than vitamin E.
Co Enzyme Q10 is a fat soluble vitamin like substance found naturally in all forms of animal life. It is the power plant of the body that is found in most cells, with especially high concentrations in the heart. In addition, it is a potent antioxidant, similar to Vitamin E.
The most expensive form of minerals found in vitamin pills, few brands use them exclusively but Nexgen� does. All the minerals a re in chelated form; they are minerals which are bonded to amino acids for superior absorption. High Quality Vitamins A, B6, C, D, Natural Vitamin E, Thiamin, Riboflavin, Niacin, Biotin, Folic Acid and Pantothenic Acid A complete spectrum of vitamins in amounts in line with current EU guidelines. Patented Bioperine has been clinically tested to significantly enhance the bioavailability of supplemented nutrients through increased absorption. They are very stable compared to other types of pro-biotic being resistant to stomach acid thereby providing optimal growth in the intestines to benefit intestinal health. Each batch of Nexgen is manufactured by Reflex Nutrition in accordance with ISO9001 quality control procedures in a carefully controlled environment using 100% renewable electricity. 120 capsules- 30 day supply based on recommended dosage. Directions for use: Take 2 Capsules twice daily with meals. Do not exceed the recommended dose. Keep away from reach of children. * Nexgen� multi vitamin/mineral/botanical blend (magnesium aspartate, citrus bioflavanoids, ascorbic acid, green tea extract (95%polyphenols), zinc l-monomethionine, iron biglycinate, grapeseed extract (95% proanthocyanidins), Lyc-O-Mato (10% lycopene), d-alpha-tocopheryl acid succinate, nicotinamide, pyrodoxine hydrochloride, riboflavin, calcium pantothenate, choline bitartrate, inositol, thiamin, BioLut (tagetes erecta,flower (90% Lutein esters of which 45% trans lutein)), querticen, Lactospore pro-biotic spores, copper amino acid chelate, manganese amino acid chelate, boron amino acid chelate, vitamin a, CoEnzyme Q10, Selenium Select (l-selnomethionine), vitamin k2 (menaquinone-7), chromium amino acid chelate, bioperine(piperine extract), molybdenum amino acid chelate, folic acid, vitamin d3, vitamin b12 (Methylcobalamin), biotin), magnesium stearate, silicon dioxide. * * No EC RDA Established. High quality, potent vitamin, chelated, mineral (more easily absorbed by the body), herbal and pro-biotic complex. Also contains extensive anti-oxidants, herbal extracts and the patented bio-availability enhancer Bioperine, which increases absorption. Uses the Selenium SELECT, the same selenium used in one of the biggest studies in the USA to help prevent cancer. Extra antioxidant protection from Lutein and Lycopene. Check out the new "Peel Back" label on each pot with lots of extra information lurking beneath!